Looking for other Australian attractions besides the much-commercialized Sydney Opera House or jumpy kangaroo? A fresh, tempting travel experience perhaps? Then you are in luck because Australia still has untold wonders to offer those who know where to search. Just south-west of Cairns lies a fertile plateau known as the Atherton Tableland where tourists are guaranteed to have a whale of a time. Covering an area of 64,768 square kilometers and a diverse region of ancient rainforest, wild wetland and harsh savannah, the Atherton Tableland boasts an abundance of wildlife and awe-inspiring natural wonders, not to mention a few places of interests created by the people of old. 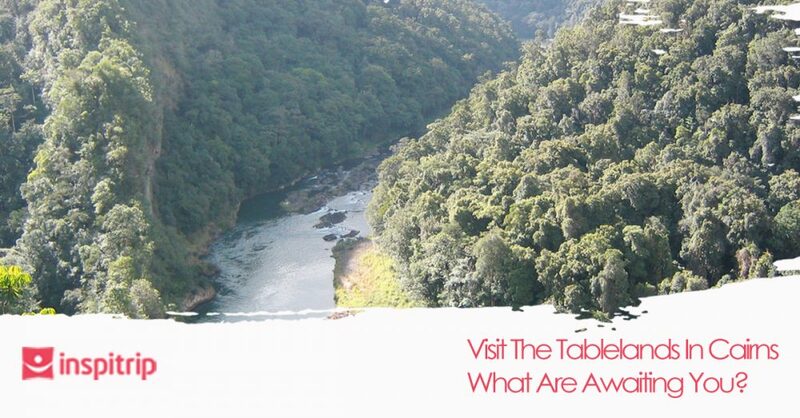 This guide will tell you all you need to know before going on a trip to tablelands in Cairns. Millaa Millaa Falls have their names derived from a phonetic adaptation of the word “Malay Malay” in the language of local Mamu people. The word refers to a rainforest vine that grows plentifully in the area. The Atherton Tableland is a happy hunting ground for waterfall lovers for hosting a large number of stunningly beautiful roaring falls. The jewel of that crown is the Waterfall Circuit, a well-known loop road that connects three fantastic waterfalls: Millaa Millaa, Ellinjaa and Zillie Falls. The Millaa Millaa Falls are the most famous and impressive of the three, and are constantly visited by large number of tourists. 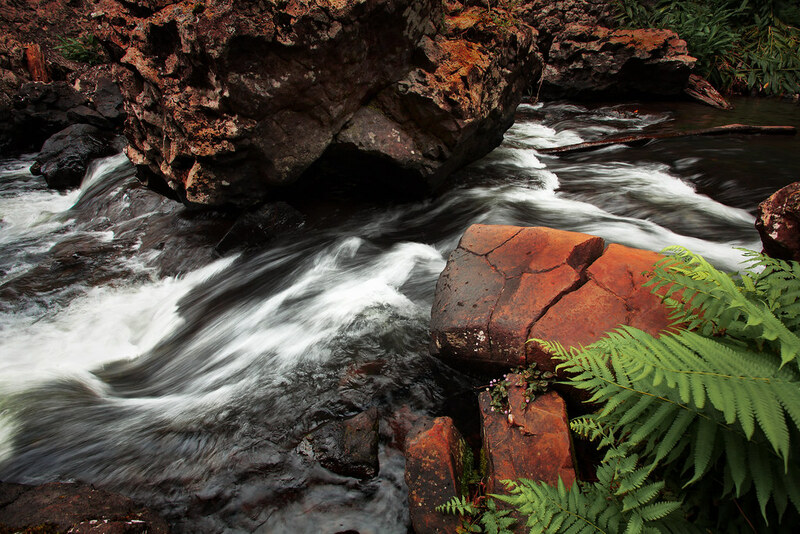 The lush rainforest and verdant patches that surround the falls, as well as the popular plunge pool that is fed by the cool water cascading loudly through magnificent rocks, make it easy to figure out why. On the other hand, Ellinjaa and Zillie Falls, though also endowed scenic beauty, are more moderate and intimate, the kind of places where weary travelers can relax and take a rest in the quiet of nature. The Waterfall Circuit waterfalls are located only dozens of minutes away each other so it should not be a problem to visit all three of them in a row. Explore the top things to do in Cairns with inspitrip.com now! Hasties Swamp was declared a national park on 5 April 1980. Hasties Swamp National Park is located near the town of Atherton and seen as nothing short of a heaven for bird-watching fans. A large seasonal wetland renowned for the diversity of its winged inhabitants, Hasties Swamp has over 220 identified species and a large two-story bird hide that is an excellent place for visitors to view chicken-hearted (or rather bird-hearted?) water birds at close quarter without alarming them. This facility is also accessible to wheelchair users. The best time to visit Hasties Swamp is from April to October when the swamp dries out and allows countless birds to take refuge here. What is even more interesting is that the park is open 24 hours a day, so you might as well go there at night when a lot of species are at their most active to watch the amazing things that you can’t see during the day. The mountain was named after Sir Henry Bartle Frere, a British colonial administrator and president of the Royal Geographical Society. Its Aboriginal name is Chooreechillum. 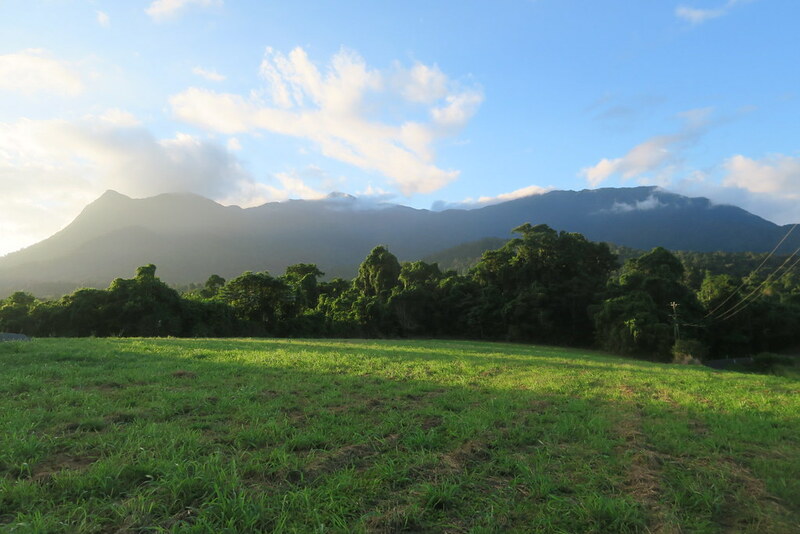 Rising 1,611 meters above the sea level and completely covered in rainforest, Mount Bartle Frere is undoubtedly one of the highlights of the tablelands in Cairns. It is the highest mountain in Queensland and has attracted quite a few adventurous tourists. The best thing to do, naturally, is climbing, but be warned that the hike is challenging and is not for the faint of heart. The terrain is quite steep, and parts of the trail are slippery with some boulder-hopping required. The reward, however, will make it all worthwhile. You will be able to trek through one of the most ancient rainforests in the world, with the opportunity to see for yourself up to 500 species of trees, numerous species of birds, as well as native Australian mammals like possums. Once you reach the top, you will enjoy a panoramic view of the beautiful Wooroonooran National Park, as well as the azure ocean dotted with several small islands nearby. There are many accommodation options like hotels and resorts around the mountain or camping areas along the trail, but booking in advance is recommended as demands are always high. 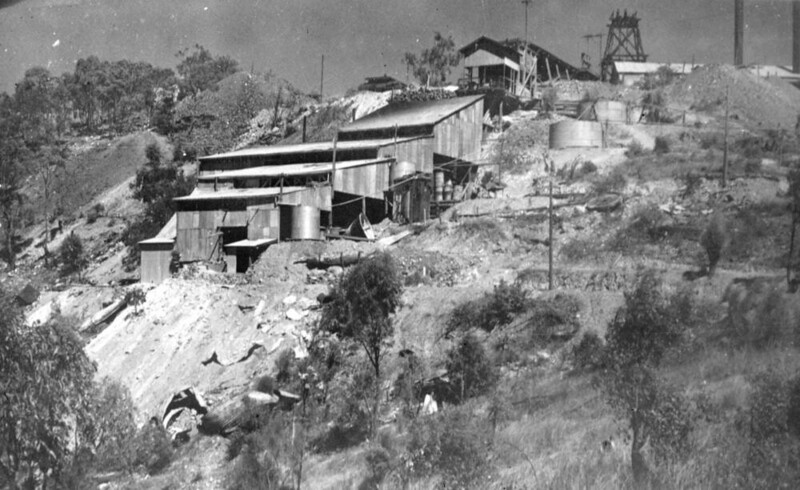 Tyrconnell Mine was discovered in 1876 by an Australian prospector and explorer named James Mulligan who was commissioned by the Queensland government to find gold fields. Over a century ago, more than 10,000 toiled through the rugged hills Tyrconnell searching for gold and a chance to get instantly rich. Now, you can follow their path through what is left of the old gold mine and let your imagination run wild, thinking how this was like in its, well, golden days. Also, as the mine is located in a wilderness and completely off the beaten track, you will be able to really immerse yourself in an outback experience. It would be so adventurous to roam by the scrubby bushes and tall trees in the wide open spaces to look for exotic birds or explore remotes corner of the area. Tourists can find accommodations in several heritage-style cottages nearby that come with their own kitchens and bathrooms or in the campground located near Tyrconnell Creek. Forget about creature comforts as the on-site power supply is limited and you have to cook your own meals, but doesn’t it just add more to the appeal of an adventure in the wild? The temple is the only one outside of China dedicated to Hou Wang. Hou Wang is not a name but a title translated as “Prince Marquis” or “Holy Marquis”. It would be a shame not to visit tablelands in Cairns without stopping by Hou Wang Temple. 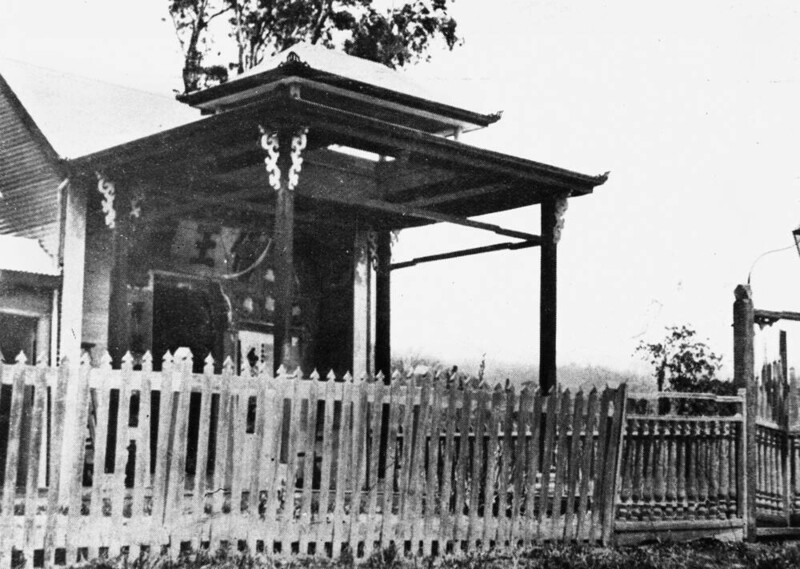 Constructed in 1903 and dedicated to a brave Chinese commander of the same name who defended his kingdom in the 13th century, the temple is all that was left of the original Atherton Chinatown as well as the only surviving timber and iron temple in Queensland. The temple is architecturally fascinating due to its Oriental materials and furnishings along with a variety of cultural artefacts housed inside that can give visitors a glimpse of past Chinese migrants’ social and spiritual life. The temple and the adjacent interpretative gallery are open to the public six days a week, closed on Mondays. 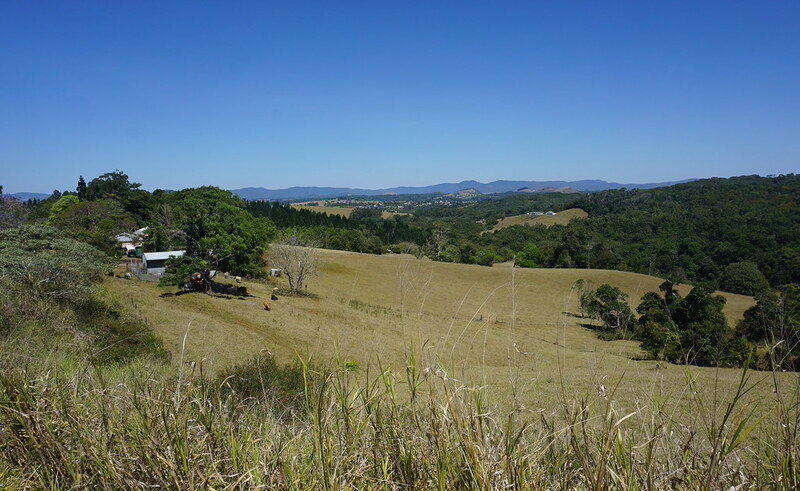 Yungaburra Markets are located in the middle of the historic village of Yungaburra on the Atherton Tableland. Fancy some unique and distinctive souvenirs that will forever remind you of your lovely time in Cairns? Then visit the Yungaburra Markets, widely known as the largest fair in Far North Queensland. The market, which is open from 7:30am – 12:30pm on the fourth Saturday of each month, is the one place where hundreds of local growers, producers and artisans congregate and sell their fruits of labor and passion. They can range from real fresh fruits, vegetables, poultry, etc. to organic beauty products, oil paintings, pot plants and handmade ornaments. All are locally produced and sold so their quality is quite reliable. Even if you’re not tempted to buy anything, which is unlikely, feasting your eyes on countless stalls of attractive and colorful goods alone is a pleasurable thing to do. When your pocket gets a little lighter, just take some time to admire the historic Yungaburra village that has remained virtually unchanged since it was built more than a century ago. Though the old streets or the traditional cottages in the locality can be crowded with tourists at times, the feeling of rusticity and serenity always reigns over the place and can smack modern travelers with nostalgia. Cairns has reportedly more than 300 sunny days a year, making it a great spot for hot air ballooning. It is amazing enough to explore the tablelands in Cairns on foot, by bus and by train, but how about taking to the sky? 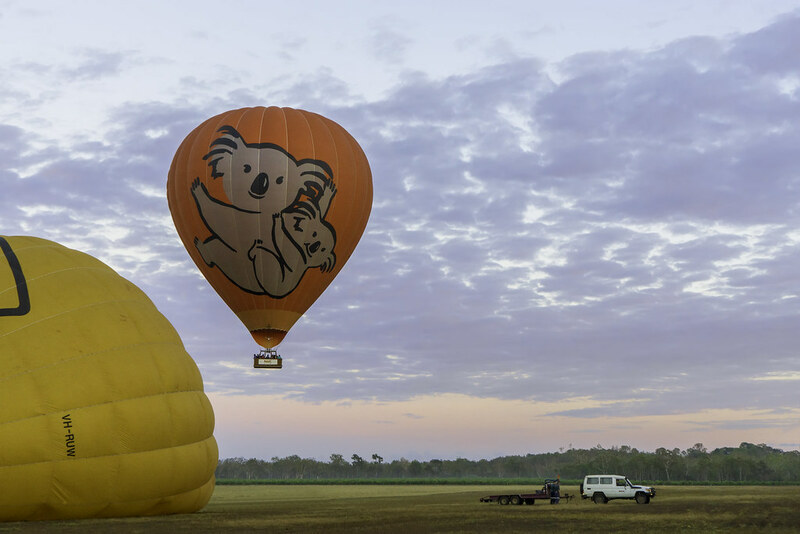 Sign up for a hot air balloon ride and you will get goosebumps as your balloon gently inflates, rises up and flies over the scenic Atherton Tableland. You will find it absolutely breathtaking to have a bird eye’s view of the tranquil country landscapes, impenetrable rainforest, rugged mountains that keep rolling back beneath you as the balloon floats by. This could be one of the most thrilling and sensational travel experiences that you can have. A 30-minute flight ticket costs AU$ 260 while a 60-minute one is priced at AU$ 345, including the ride, hotel transfers, commemorative certificates, commentary and insurance. A hot air ballooning tour tends to start at 5:00 AM and is not suitable for children under 4 years old.